Posthumous fragments: In some remote corner of the universe that is poured out in countless flickering solar systems, there once was a star on which clever animals invented knowledge. That was the most arrogant and the most untruthful minute in ‘world history’ – yet indeed only a minute. After nature had taken a few breaths, the star froze over and the clever animals had to die. In the light of infinity, the limited time a human being spends on this planet does appear tobe deplorable, even ridiculous. Knowing about the futility of his existence, man tries to comprehend life by means of language which locks him into the cage of concepts though. Language, following Nietzsche, denies access to the actual life of matter. Searching for knowledge about the world, about truth, about himself, man gets lost in the woodwork of his own thinking. To put it casually: man becomes a blockhead, unable to see what is there. Taking away the foundation of the boards that mean the world to him: this is what it means to live. Frank Willens (US/DE) is a dancer, choreographer, performer, interpreter, artist, actor, collaborator, tour manager, human, father, singer, beat-boxer, thinker, marathon-runner, train-traveler. He grew up in California and has lived and worked in Berlin since 2003 where he has had the privilege to work with a wide number of persons in a wide range of projects presented in a wide range of venues. His associates include Tino Sehgal, Meg Stuart, Falk Richter, and Peter Stamer, to name a few. 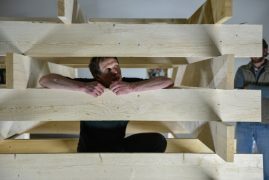 Frank developed a project in collaboration with the Transform Festival in Leeds in 2015 and headed a residency/lab at the Kunstmuseum in Bonn in 2016. His new solo piece sixty minutes towards being here or what we can do until we do what we can do premiered in Berlin in January 2017 On Truth and Lie in an Extra-Moral Sense is his 5th collaboration with Peter Stamer. Peter Stamer (DE/A) is a theatre maker in the context of contemporary performing arts. In his projects, he is interested in exploring conditions for discursive and physical empowerment within given performative, social and narrative apparatuses. Currently, Peter is working on a theatrical and installative adaptation of Kafka’s story In the Penal Colony (to premiere in 2017).